The interest on Pinterest has grown exponentially and users have been pinning photos from all over the internet. If your site leverages on having loads of images, this pinning fever might worry you a little – there are references to Pinterest as being the ‘haven for copyright violations’ for a reason. If you are not fond of having your valuable copyrighted photos pinned by these pinners, it may seem like there is nothing you can do to stop them, or is there? Pinterest itself has released a new feature that will allow you to disable pinning activities on your sites with a meta tag. It’s very simple to implement on your site, and there’s also a plugin you can use if you work on a WordPress blog. In this article, we will guide you on how to use these Pin-prevention methods to protect your photos. With this meta tag, Pinterest users who attempt to pin your photos will get this error message. If you are using WordPress, you can simply add a new plugin to stop pinning activities. An example of a plugin you can use is called Pinterest Block. To use this plugin for your WordPress sites, go to your WordPress admin page, click ‘Add New’ under ‘Plugin’ section, and search for ‘Pinterest Block’. Once you have found the Plugin, install and activate. 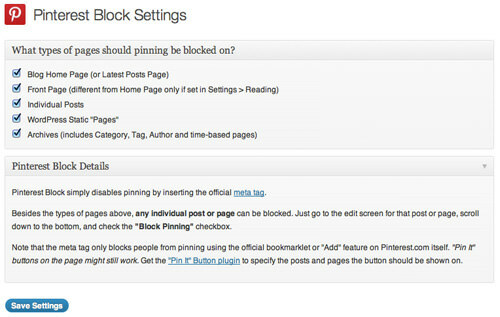 In the option panel, you will have a few options on how you want Pinterest Block to work on your site. Check the options that are suitable for your site, then click "Save Settings". And that’s it; Pinterest users will now no longer be able to pin any photos from the pages you’ve blocked. The error shown will be the same as those for html websites. With only a simple step, you are now protected from photo copyright violations. Users are random and not many of them are aware of copyright issues, but with this meta tag, you can continue producing great photos and publishing them on your sites without worry.